“Long before she founded and led companies, Lisa Bair sold fried chicken in brown polyester bell-bottom pants one summer after high school. She took the initiative to sew her way into an updated straight-leg look. “I almost got fired for defacing the corporate uniform,” she said. Conformity was “not my strong suit,” she realized. She would go on to tailor much more ambitious business plans. 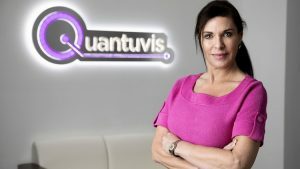 As founder and CEO of Quantuvis LLC, a healthcare information technology company based in West Palm Beach, she says the firm is out to improve on “manual and highly inefficient” methods often involved in the business of getting prescription drugs into the hands of consumers. “Through the use of our technology, we help managed-care companies and pharmaceutical manufacturers save time, reduce errors and improve financial performance through streamlined drug rebate negotiation and management,” she said. The ultimate goal: “providing more affordable patient access to their medications,” she said. The tenant also spoke about having a downtown office space and expressed the vibrant energy that comes with having a space in Downtown West Palm Beach “When I walk outside from our offices on Clematis Street, I feel a new energy, a vibe that comes from a younger generation who have chosen Palm Beach County for both personal and professional reasons, and it is nice to be a part of that growth,” she said.